2nd VIC - Bow: H C Maling, 2: Cecil N McKay, 3: Herbert Smyth, 4: Jud H Harding, 5: H Robert Rush, 6: Jack L Mounsey, 7: R (Bob) V Gregg, Stroke: James M Buchanan, Cox: J McGregor, Cch: Alex B Sloan, Emerg: G Anderson, Manager Edward Kenny. This was the first Interstate Eights Championship raced for the King's Cup. However for the record, it is recorded that crews raced for the King's Cup from 1920. It is interesting to note that both the first and second placed crews were club crews. 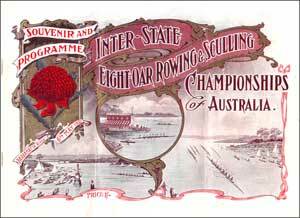 South Australia came from the Murray Bridge Rowing Club and the Victorian crew from the Mercantile Rowing Club. South Australia led from the start gaining a length by the mile mark. By half way the waters roughened considerably and South Australia handled the water better than the other crews maintaining their length. QLD did not finish after being swamped. The time for this race was regarded as a record. However this race was conducted on the 3 mile course from Ryde to Henley Wharf, not the longer championship course which finished at Searle's monument. The Victorian crew was challenged for the right to represent by a Ballarat crew but the VRA selection committee did not entertain the challenge. The sculling race was also conducted in rough conditions and Bull used his local knowledge well to use the best water as the other scullers floundered in the conditions and maintained erratic steering. He won but three lengths. The women's race was conducted over half a mile. This decision was made at the second conference of the women's association in 1921 on a split decision and the casting vote of the chairwoman. Tasmania led from the start, but South Australia closed the margin to half a length by the finish with Queensland well back.